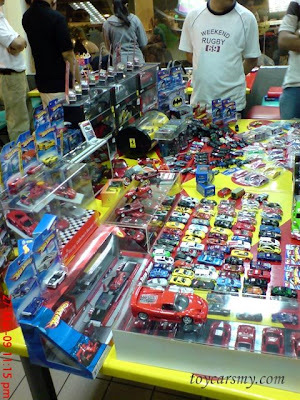 The Hot Wheels Collectors Malaysia (HWCM) gets on the media for the 1st time. The Interview was arranged on last Friday of March (27/3) by Jo Huang, Ogilvy PR working together with Desmond, my partner from HWCM. Ogilvy, PR for Shell met the Hot Wheels collectors to understand their opinions on the latest Shell Ferrari Promotion. The participated members were more than in the picture, I did not count, but at least there were 30 of us. When I left about 11:30PM, there were still members entering to the group. The event was very successful, I would say it won't be interesting without participation and efforts from members and their collections. Lastly, just want to express my appreciation to everyone who made this happened. Thank you. 1 more photo took from my mobile phone (Uncensored), guess who is that "Weekend Rugby 69". Winner no prize. all this car for sells ? is that VW bettle green white taxi from MB :P next to the white VW Golf gti at middle of the photo??? kudos to you guys!!! keep the spirit high up!